Haven Moore and Iain Morrow have been living a blissful life in Rome, an ocean way from the Ouroboros Society and its diabolical leader. But paradise is not to last. The mysterious disappearance of Haven's best friend, Beau, sends the pair running back to New York, where they encounter the Horae, an underground group of women who have spent centuries scheming to destroy Adam Rosier. Only they can help Haven uncover the secret to Beau's whereabouts in one of her past lives. But their help comes at a price: Haven must infiltrate the Ouroboros Society, charm Adam Rosier, and lure him into a trap. It's a plan the Horae believe will save the world-but Haven and Iain fear that it may destroy the happiness they've been chasing for two thousand years. Adam - he's not as creepy in this book as he was in The Eternal Ones. I actually liked him this time around and his effort to reform himself... I especially love the aura of mystery to him. Chaos is a good way to describe him, and I wonder what will happen with him next. (That is, if there is another book. The ending is certainly open for more, but I haven't been able to find any news about the series.). Reincarnation - What I think Kirsten Miller does exceptionally well is that she chooses to explore only one of Haven's past lives and lets that one become a theme of the whole book. I like seeing how that past plays itself out in the present... and of course what it reveals about the relationships of the characters. Feel of Book - By this, I mean the fact that All You Desire is part-mystery, part-supernatural romance, part-thriller, part.... so much. I just love how utterly together this book feels despite its slight exploration in various genres. Does that make sense? It doesn't precisely have the action inherent to a thriller but retains that feel of mind games--who should Haven trust? How much does she know about her own past? etc. And it has that sort of feel with everything else. Haven - Oh, lord, she annoyed me in The Eternal Ones (especially regarding her relationship with Iain) but yay! I actually liked her in the sequel. She's way more mature now and her decisions make more sense to me.... I still don't completely like her... but she improved a lot and has a great deal of potential. Pacing - The book is filled with lots of dialogue and lots of action. It reads pretty quickly. Characters - Even though the book reminds me of the Blue Bloods series in that it has the same sort of chic feel to it, its characters are so much more entertaining... In my opinion at least. I think that's mostly due to writing style. While Melissa de la Cruz has a tendency to describe every last character, Kirsten Miller introduces a lot of characters who have a great deal of potential without dragging us down in details... yeah, maybe we don't find out everything about them now, but because of the nature of the book--with the Ouroboros Society and whatnot--we know that their pasts are going to come into play... and that underlying the history is a complex relationship that'll be explored later. Plus, not describing all the characters and instead allowing their dialogue and actions to define them really helped the pacing and made it that much more fun for me to read. I also really liked the twist that the Horae add to the supernatural world Miller is building. And the snake goddess? What? I want to know more about how that works. Reincarnation - Because it still doesn't make sense to me. Why did it take Haven 90 years to be reincarnated from her life as Constance to her current life? And Adam also mentions something about people 'choosing to return.' Why has she chosen to return? I remember Iain saying in Eternal Ones something about his theory that he returns so that she won't fall into Adam's hands. But to me, that makes no sense... Because haven't they spent a few lives together, happy with each other? And if they live a happy life and then die, why come back? It's not the technicalities of reincarnation that bothers me--like how it actually works [except for the amount of years; that annoys me]--but instead the loop holes that have yet to be explained. And while I enjoy a book with open ends that allow us to imagine the possibilities for ourselves, I also would like some attempt at explanation. The Ending - While I liked the open feel to it and the possibility of a sequel, I didn't enjoy the explanation that was provided regarding what happened to one of the characters. As you can tell, I didn't dislike very much about this book :). In fact, I think that it's much better than The Eternal Ones. 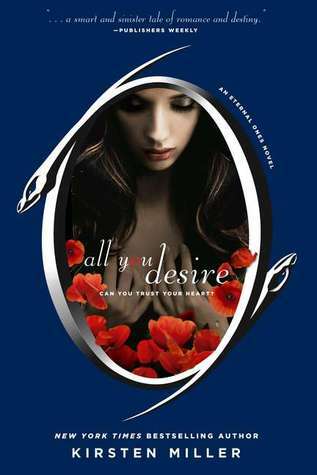 All You Desire is a fun read filled with enough suspense and romance to keep you hooked until the very last page. I hope you guys check it out. Adam will always be my favourite character!